I didn’t really taper for the 12. If anything, I increased training load during month of June, though cut out any intervals. Hill climb intervals take a lot out of you, and can leave exhausted, but this training of sweet spot, makes me less fatigued, and you can repeat more often. In the week before, I wasn’t sure what to do, but I did two 100 mile rides on Sun and Tues. Only in last two days did I rest. I didn’t look at it before the 12 hour, and made no scheduling at all. I rode without a plan, (though I don’t necessarily recommend this). Though looking at the estimates after the race, it proved quite a good guide. I’m not sure about the tailing off towards the end of a 12 hour. In my case, I was a little conservative in first three hours, then better in the middle. I tailed off for the last two hours, but I think that was as much due to the weather as anything. On ECCA 100, I did 3.34. The Welsh course is slightly slower, so the chart would predict a time of around 290 miles. Without 13 minutes off bike and with better weather, I think 290 miles would have been a reasonable guess from my actual of 284. I rode mostly on feel, rarely looking at power meter, time or average speed, especially in the middle section. My over-riding goal was to finish. After 3-4 hours, I felt a little bit more confidence and got into a good rhythm. After this my speed and power increased in the middle section. If I could change one thing about this year’s preparation I would pay more attention to strengthening shoulders and back. It was my shoulders which went much sooner than my legs. I did the plank exercises in winter, but by Feb I was riding and gave up any core strength exercises. It’s a bad habit I always seem to fall into. But, for next year, I have to do something to strengthen back. Bike I used. Zipp 404 on front (808’s bit more difficult to handle. A few weeks ago I went for aero testing at Newport velodrome. We made many marginal gains, some of which are quite difficult to maintain for more than 3 hours. For equipment choice I weighed up aero vs comfort. Firstly, I changed some Drag 2 Zero arm rests (with only thin pad) for original Bontrager pads with thicker pads. I don’t know how much this cost in aerodrag, but it was definitely worth it. Old Skinsuit. I had a big dilemma whether to use my incredibly tight and aero Biorace skin suit vs an old but comfortable Impsport skin suit. I chose comfort and think it was the right choice. 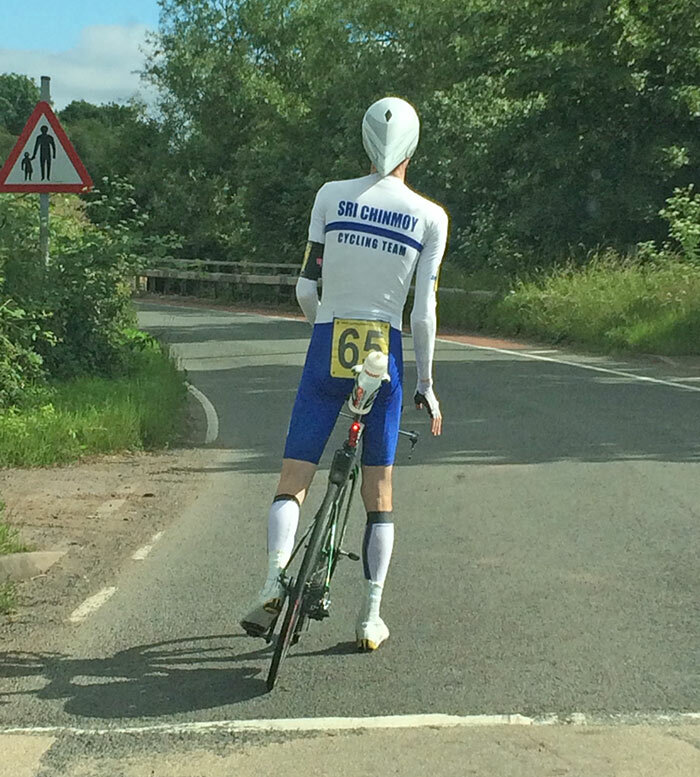 It would be a bit of a gamble to try ride a Bioracer skin suit for 12 hours. I don’t know the aerodrag difference between the two. Giro advantage vs Kask Bambino. I was torn between a Kask Bambino and Giro Advantage helmet. Giro is faster for me but more uncomfortable. I also didn’t use a visor because I expected rain. Next time I may use Kask, because it was hard er to stretch with long tail. I also wore a pretty warm undervest because I expected rain. I didn’t make any changes to bike set up in terms of raising bars. Dash saddle. 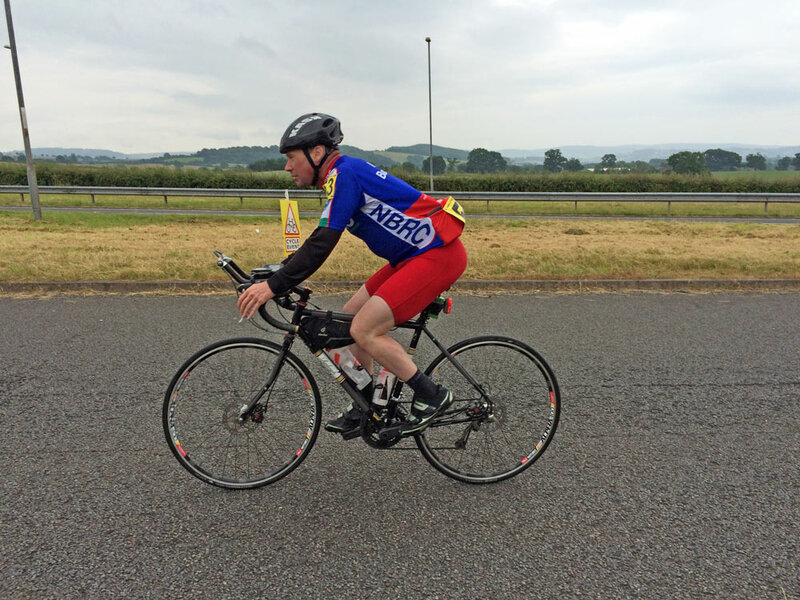 I didn’t feel much saddle discomfort during race, which was a relief. The Dash saddle has cut out in middle, and I changed position fore and aft on the saddle. I just put a lot of Assos chamois cream on before the start. Rear light. I used a fully charged Knog Blinder rear light because it fits around aero seat post quite well, though when I finished I seemed to remember it wasn’t on. I hope it didn’t fail me for long, because it was definitely a day when you wanted a working rear light. Maybe it was on, but I was too dazed to see. Mental challenge of riding for 12 hours. Every other distance, you can train at similar durations. But, a 12 hour is always going to be an unknown quantity. Everybody will find a fluctuation in emotions and thoughts during the race. Like – why did I enter? at some point. I was surprised that the hardest point of race mentally was at 40 miles, after just one and half hours. However, when I relaxed from thinking about distance and speed and just concentrated on getting in to the rhythm – time and distance started to flow. When you get into this more relaxed state, it became much more enjoyable and you gained confidence you were going to finish. The rain and cold made it hard for last two hours. I must admit I lost focus on last few laps, and slowed down quite a lot. I was only thinking about hanging in and just rolling around. At one point someone came past me really fast, and this galvanised me to make more effort for a bit. I realised I still had quite a bit left in the legs, even if my shoulders had given up. When I went past riders I would often shout some encouragement, like ‘Keep going’ But really it was just as much for my own benefit, it was like giving myself encouragement. I would also sometimes thank marshalls standing at corners, just because it was nice to have some interaction with other people – plus you ddeserve some gratitude for standing in rain for 12 hours by a dual carriageway. I tried to calculate best way of getting around 60-70 grams of carbohydrate per hour. I estimated one 750ml bottle of energy drink + one gel. The mistake was that because it was cold, it was difficult to drink 750ml per hour. I should have had less water, but a few more solid bars. After 10 hours, the quantity of energy gels + energy drink started to tell on the stomach. I have a reasonably good tolerance to sugar, but I’ve never had that quantity of maltodextrin and fructose before. After race, I also felt sensitivity in a tooth, I don’t think these events are good for your teeth. Helper. Having a helper in a 12 hour is a real boon. It was the first time for both of us. Because it was a circuit, we stayed at one point. It meant I only saw every 26 miles, which was fine on cold day. Though it does put pressure to get everything right, if you want more food, you can shout, but then you have to wait an hour to get it. A big advantage of a helper is only having one bottle on the bike at a time. Though if it got ejected, it could be a real problem. Trek Speed Concept top tube carrier. 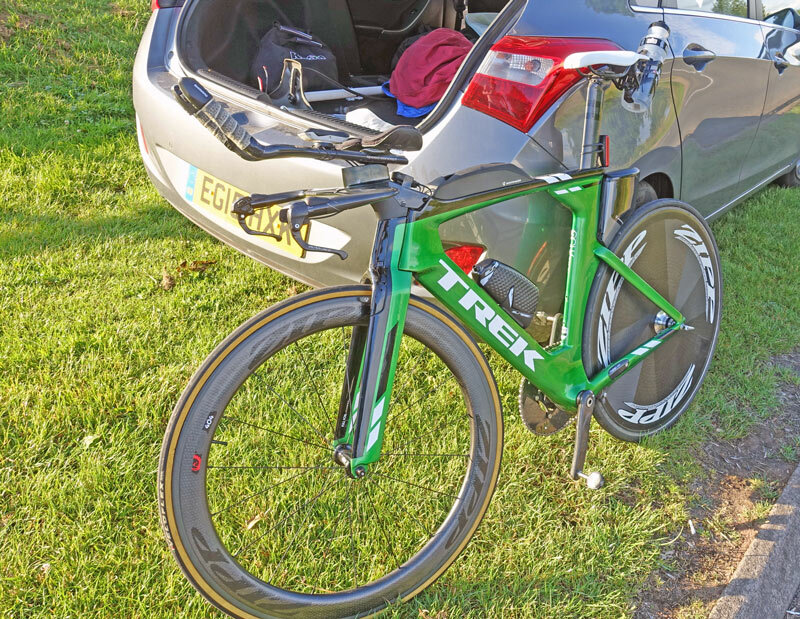 This is an excellent aspect of Trek Speed Concept, you can easily carry three energy bars / gels + empty wrappers. It is easy to access and not too bad aero wise. The Trek draft box was also useful for carrying mobile phone, car keys, money, air cartridge, spare gloves and gillet. Carry spare energy bar for emergency. For most of ride I had nothing in reserve, we lost contact for 50 miles, so I stopped to pick up food by road. Something in reserve for emergency would have been better. It meant I had some anxiety about getting more food. Drink a little less, eat more. I lost six minutes due to natural breaks. I only stopped twice, but it took so long because of the quantity of water! When its cold, it goes right through me. This is the kind of thing you can’t make any rules about, but have to see on temperature. Tip from Howard Waller – set Garmin to record laps every hour. I have for every 10 miles, which is a bit overwhelming. Make sure mobile is in a proper waterproof bag. How to go faster next time. I’m sure everyone does a 12 hour time trial and thinks of ways they can go faster next time. I suppose you are also never going to have the perfect 12 hour experience and being prepared for difficulties helps to avoid frustration. Approx 13 minutes lost to time off bike. 3 minutes at traffic lights, 6 minutes natural breaks, others for clothes and food e.t.c. There will always be time off bike, but 13 minutes starts to be quite a few miles. Stronger shoulders – Being able to hold position on aero bars, would save aero drag and also reduce mental anxiety of pain from two hours into ride. Could have started a little stronger, but not much. The last two hours, if I’d been warm I could have gone a bit better. I wouldn’t change mental approach too much. Having ambitious targets could be self-defeating. I liked the non-competitive approach – just stay on road for 12 hours and see how far you can go. Tues – 27 miles. Shoulders really hurt. Legs OK riding, still a little on stiff side. Yet another ride in the rain! I’ve been wet for past 20 rides in sequence. The result is at CTT. I finished 2nd – a medal at 12 hours time trial makes a nice complement to the national hill climb championship! Very well done! Thought it was your first go, so, really, very little that could go wrong, did. Thanks for the write up, as usual! Hi Tejvan, I dont think we got a chance to chat after the race, I was in a bit of a state. I haven’t had much luck either post 12 as I was hit by a car 3 days after! Love the blog, hope you heal up soon and all the best for the rest of the season. Hi Danny, thanks for visiting blog. Congrats with national 12, and hope you make full recovery. Just a quick note to say thanks for the shouts! I think you passed me twice during the day and in particular in the rain on the finishing circuit all encouragement was welcome!